Here is for you a very special Soulful House Mix: Orchestral-House at its best! But lets go back: Disco Orchestration evolved during the late 70s disco era, the most popular formation was the Philadelphia Symphony Orchestra, their sound got known as Philly Soul. While the philly sound was more funky other orchestras like the New Yorkan or the Los Angeles Orchestra supported many uptempo disco bands. You've sure heared the sounds of the Salsoul Orchestra or First Choice. Well, this sound harmonizes extremly well with house music and one of the greatest producer in the last years is DJ Meme. He combines the orchestral sound with house elements, building outstanding and timeless house music songs. So i did a selection of the greatest Orchestral-House songs, all in one mix! This one is for your romantic moments, it lifts you up and shows you the bright side of music. Be sure you check this out! You also may want to check out an interesting interview with DJ Meme from April 2009 while his visit in Moscow. There's also a video of his gig, done by DJ Soulmate of summerfondue. Have fun! I want to show you today a great DJ community that i found, where you can upload your mixes for free! The site is specialized on house music, there are many sub-genres where you can put your music into, but there's space for other other genres, too, like Techo, Trance or Drum 'n Bass. The community functions are great, it reminds me a bit of and older facebook version ;) You can set your own status, check out what other people are doing right now, you can create your own profile and upload or link to as many mixes as you like. You can rate other peoples mixes, comment them and add them as a friend. A forum and blog is also present. Check out my profile on house-mixes.com. One of the best things is you can put a jukebox on your site and feature all your mixes. The show begins at 8 p.m. origin time, so this will be 19:00h for Western Europe (Berlin, Paris) and 18:00h for UK. Don't miss it. Click here to listen to the show. Update: Get the 2nd hour with amazing house stompers from Burlak here! 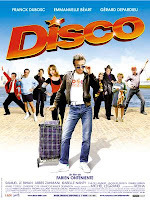 If you like classic 70s disco music, shiny disco balls, afro heads, funky moves and bell-bottoms ... i got a hot movie tip for ya: Disco - Le Film, a french production from 2008. Of course, the story is quite simple but the actors (with Gérard Depardieu) and the dancing scenes are great and so is the film worth watching! It features not only 70s disco music from Boney M. und Eartha Kitt but also some fresh tunes from Cerrone (Laisser toucher). Fresh out of the mixer comes the Revisited House Chapter 4, it's Disco time, Baby! "Disco Lights are flashing, everyone is dressed in the latest fashion." Check this mix out and catch the original disco feeling from back in the days, feel the love and the vibes of the late 70s. Pay attention to the last track from Pascal & Mister Day on the label "Glasgow Underground", it's a very hard to find record! The long awaited HedKandi Cologne Party took place last weekend, but to say it in few words: Nothing for real house music lovers! Ok, the location was great, also the decoration was. Jamie played some nice (commercial) uplifting house tunes in the first two hours. But after midnight the music changed and Jamie and Wez played tunes you've heared over and over again. Mainstream Tech- and Electro-House, nothing fresh, innovative or special, maybe two good tracks per hour. I saw some other people being frustrated from this same old sound you hear in Cologne for years now. Let's hope it's gonna be better the next parties! More funky and soulful, bringing us the real HedKandi feeling from UK and not trying to fit into the contemporary german music. Check out the HedKandi party pics. Here we go again with a laid-back and soulful latin-flavoured Mix, the Lounge House Volume 3. This Mix is peppered with many high addictive tracks you won't get out of your head for some time. I did a test-drive with this mix while i was on holiday in sicily, it fits perfectly with summer, beach and cocktails! Phil Asher's Restless Soul Mix of Portuguese Love is a masterpiece of Latin House Music, perfectly composed and arranged. My favourite one here is Alix Alvarez' Mix of Minimoogli's 99,9 - it's a real stomper. Make sure you don't miss this one!